How to Get Free WiFi On Your IPod Touch Anywhere – One of the best portable media devices of the planet is the iPod Touch. It is no wonder why iPod touch has been considered one of the best-selling devices since its release in 2007. What else do you want from iPod touch? You can play your favorite songs, videos, and movies. Likewise, your favorite games and applications can also be accessed using it. You don’t have to worry about connecting to your friends using several social networking sites because you can do it the iPod touch. All you need to is to have a Wi-Fi connectivity and your boredom will be addressed. Wi-Fi is a wireless connection. It allows you to be connected to the internet and surf all the websites you wan. You need to be in a Wi-Fi hotspot so that you can be connected to the internet. However, not all areas are Wi-Fi hotspot. Basically, some shopping malls, restaurants, cafes, and hotels provide free WiFi access to their guests and customers but not all the time you can get free access to it. Well, not to mention the number of users connected to a single Wi-Fi hotspot or network, thus, making the connection slow like it takes up an hour to load Facebook. Ah…that is really frustrating. In this article, let me share an important technique on how to get free WiFi on your iPod touch anywhere you want to go. You heard it right, this one is true. If you are doubtful, check it out first before saying something. It will cost you nothing but you will gain more from it. Trust me and you’ll see. First all, you need to jailbreak your iPod Touch because you need to install Cydia. Cydia is very important because it allows us to download and install third-party software, which we are going to use to gain access to Wi-Fi connectivity. Tap on Manage at the bottom of the application. Key in the url http://sinfuliphonerepo.com and tap Add Source. Find the SinfulIphonerepo source at the list and tap the Search button. Key in the keyword MyWi (no spaces) then at the list, select MyWi Cracked. I assume that you already know how to install an application, right? Okay, so after the installation, launch the MyWi application. You can see the icon at your home screen. 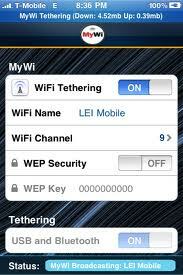 On the MyWi interface, create and name your own Wi-Fi hotspot. You can name it My Wi-Fi or Harry’s Wi-Fi hotspot. Just name it whatever you want to name it. After assigning name to your own hotspot, connect it and wait for the process to finish. You need to value patience all the time. To view if you have successfully created your Wi-Fi hotspot, press the Home button and then go to Settings. Choose Wi-Fi then look at your newly created Wi-Fi hotspot on the list. If you found your Wi-Fi hotspot in the available networks, good for you. If not, repeat the process again. Congratulations you can now connect to the internet! Simple isn’t it?